Unfortunately, we are all prone toward a tendency to gradually drift away from the correct or proper way of doing things — the precise way we were taught to perform a job or function. Drift usually occurs to fit the needs of the individual. In the absence of oversight, the needs of the individual will eventually trump the needs of the organization, process, or customer being served. As we know, what happens at the individual level eventually impacts the organization. The occurrence of practical drift is responsible for producing unwanted outcomes and can even result in catastrophe when strict adherence and high reliability are critical elements for success. In practical terms, we often find a gap or discrepancy between how we believe we performed and how we actually performed. This is likely a function of the “illusory superiority bias” (our tendency to give ourselves more credit than we deserve) and/or “complacency creep” (the false sense of security that develops when we take shortcuts in the absence of harmful consequences). This spells trouble for professional drivers, who may begin to deviate from the standard attained during the training regimen in order to make the job less taxing to perform — day after day after day. Our proven ability to meet the standard set by our organizations during our initial training period qualified us to assume the responsibility for safely transporting people where they need to go. 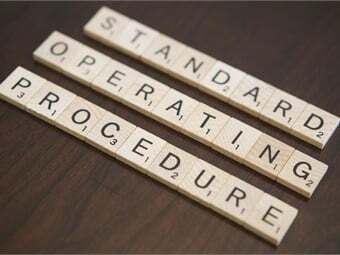 Meeting an established set of standards for performing a job or function is proof of our technical competency and core skills. Unfortunately, the discipline of our daily behavior doesn’t always match our skills and level of competency. “Ride-alongs” (also known as safety audits) tend to confirm that drivers are still capable of performing to the defined standard, particularly when we know we are being evaluated, however such activities fail to provide us with much, if any, insight into an operator’s daily actions and behaviors conducted under normal conditions. Daily oversight will often reveal a troubling degree of deviation from the norm. 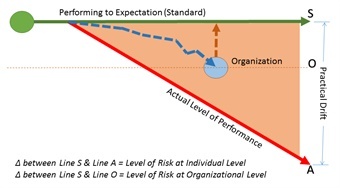 The degree to which the operator has deviated from the standard — combined with the frequency by which this deviation occurs — represents significant risk to the organization. In the absence of correction, risky behavior is able to persist and become habit. In many cases, the significance of the associated risk lies beyond the purview of supervision, enabling consistently risky behavior to persist without notice or correction. In the absence of correction, risky behavior is able to persist and become habit. As we all know, once a habit forms it is quite difficult to break or change. Often, we are not consciously aware of the frequency or degree by which drift occurs. This can be seen in a tendency to conduct rolling stops, drive over the speed limit, rush through intersections, drive without fastening our seatbelts, etc. Figure 1 shows what happens as our routine driving behaviors begin to slip from the standard we once achieved, and still believe we are maintaining, as we perform our jobs over time. Line S represents driver performance that meets defined standards. Line A represents the degree by which the performance of the riskiest driver has deviated from defined standards. Line O represents the median drift that occurs each day within the entire fleet operation. We have learned from studying critical data (compiled from billions of miles driven) that a small percentage of drivers will typically account for a large percentage of the daily operational risk that exists within a fleet operation. In a sense, this might be considered as good news. A focus on helping the population most “at risk: within an organization will offer a tremendous return on time invested in ongoing training and development. After all, these are the drivers that have drifted the furthest away from our standard. If we can help them improve and bring them back to the standard to which they were initially trained, we can eliminate a significant amount of risk to themselves and for the organization. Such efforts will greatly reduce the amount of related costs we might experience by doing nothing to combat the drift. Organizations must somehow mitigate the risk associated with practical drift by moving beyond “reaction mode,” responding to lagging indicators, toward a more “proactive stance,” focusing on leading indicators, that will serve to prevent unwanted outcomes. 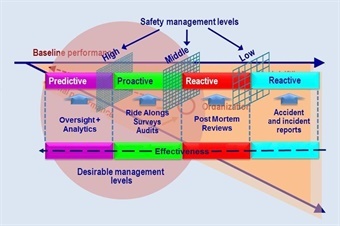 Adapted from ICAO Safety Management Systems, Barnaby O'Connor. 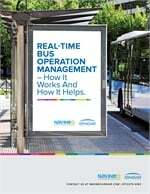 Technology is available that will enable safety managers to analyze video and behavior data acquired during daily bus operations. Such data indicates where risky behaviors are likely to occur and allows managers to utilize analytics to predict what outcomes may result if specific actions are not taken to eliminate them. In this way, the organization can maintain an appropriate level of oversight that will gain them the necessary insight to determine where deviation from the norm tends to occur. Such insight can then be used to provide the coaching, support, and consistent reinforcement of desired behaviors that will discourage and minimize drift from occuring within their operations. Preventing drift requires vigilance and a commitment to continuous improvement across all levels of the organization. Refresher training can help to fill gaps where knowledge erosion has occurred, however, frequent coaching and direct counseling is to nurture consistent adherence to the desired standard of operating proficiency and safe driving behavior needed for success. Ultimately, it is important to address instances of drift as they occur to prevent unsafe practices from becoming habit. As stated above, we are often blind to the extent and degree of our own drift, so one of the biggest challenges remains personal: How do we keep our eyes open for clues that may reveal where we are prone to cutting corners? While it is definitely easier said than done, we have to seek (and be receptive to) feedback. While our first response might be to defend our actions, we might be better served to consider how we might use the advice to ensure our own safety. 1 - “Practical Drift: Why people don’t always follow procedure” by Rosa Carillo, 12-30-2013. 3 - “Practical Drift: Why people don’t always follow procedure” by Rosa Carillo, 12-30-2013. Special thanks to Chris DeVoll from the Washington State Transit Insurance Pool for the excellent primer on Practical Drift. Steve Mentzer is a long-time industry veteran specializing in driver safety and training.